The Reference Frame: Can Christians be better at quantum mechanics than atheists? Can Christians be better at quantum mechanics than atheists? Even though I have had extensive interactions and sometimes deep relationships with Christians from many churches and sects and believers were often my natural allies, TRF readers who are Christians must have noticed that I am not really one of them. When it comes to the literal belief in the non-vacuous statements of the Bible, I don't really believe any of them. They're at most an important part of our history and culture. Even though in many polls, I would probably end up being among the 10% of the most atheist people – which is not so unexpected in my homeland – I lost the desire to constantly fight against religion a very long time ago if I ever had it. Even though religion often encourages people to think in wrong ways and believe wrong things, much of religion is about statements that science hasn't really disproven and religion is motivated by other things than the search for the scientific truth, anyway. Many undergraduate classmates of ours were believers. In general, the Catholics had different views than the Protestants. Somewhat paradoxically, Catholics looked less fundamentalist and more compatible with the modern scientific views etc. But it was the undergraduate student hostels where I was first exposed to lots of the anti-evolution talking points – and other ideas in which the religious thinking deviates from the non-religious one. And I just found most of it immensely dumb, incoherent, and at least marginally self-fooling. Mostly because the number of Christians among physicists remained low in all the environments that I later interacted with, I got used to the idea that Christians are naturally less able to comprehend physics, especially modern physics. That's why some of the sociological experience linked to the foundations of quantum mechanics looks so remarkable – but I got used to it. The point is that I was getting increasingly exposed to people who are politically left-wing and who openly view themselves as big warriors against religion – and many of those people looked more prejudiced than what I remember from the Christians. And make no mistake about it: the enthusiastic Christians have always looked intensely biased, especially in their interpretation of disciplines like biology. Yesterday, I spent more than an hour by a chat about the foundations of quantum mechanics with a staunch Czech atheist I have known for decades. (He has also been a big warrior against the paranormal phenomena and the postmodern philosophy and we would be complete ally in these efforts.) I was repeatedly told that the role that (orthodox or proper or Copenhagen) quantum mechanics attributes to the observers and observations – and especially the observer's perception or consciousness or mind – is extremely dangerous because it could strengthen all the religious and humanity types etc. Well, science is allowed to strengthen anyone or everyone. If you decide to deny the insights that science has learned, it's always you who is the loser and who may be shown to be a dishonest person. We – and I – have certainly been used to the idea that believers are more likely to distort the lessons that science has taught us than the atheists. But it obviously may be the other way around, too. On the positive note, I was immensely impressed by the five quantum-mechanics-related videos at the InspiringPhilosophy YouTube channel. If you look at the list, you won't have a doubt that this guy is a staunch Christian who probably believes much of the Bible literally. You may find videos about the question whether Jesus traveled to Egypt or Jerusalem, whether the Trinity is a contradiction or a pagan concept, and many other generic videos you expect from a reasonably smart defender of Christianity. But there are also at least five videos whose content is almost entirely composed of quantum mechanics. This 17-minute-long November 2013 video, "Quantum Physics Debunks Materialism", remains the most watched video on the channel, with almost 300,000 views. The guy who created it must have understood that he was going to be much more successful with truly high-brow videos like this one – than with generic defenses of the Bible, religion, and Jesus Christ that every other priest with a webcam could be capable of shooting. Some of the language sounds a bit religiously or philosophically loaded. But I would still argue that the bulk of the video is about the character of quantum mechanics and this character is communicated extremely accurately, comprehensibly, and honestly. The video collects lots of arguments and explanations that quantum mechanics doesn't allow the phenomena to be explained without any role of the observer and the observation. The observer is no longer a passive player in physics. But I still admit that at a certain sociological level, it makes sense to demand the accumulation of particular references and quotes from them. The authors of these papers and quotes may end up getting more credit than they deserve but at least the claims are sharply separated from each other and associated with papers that everyone may read. And the animations in these videos are pretty cool, too. In January 2014, he added a 12-minute video on the delayed choice quantum erasure experiment which I had discussed in 2010. Although it is difficult stuff and you may misunderstand many of the technicalities even after you watch the video, he did a good job in explaining that this experiment pretty much implies that the past only exist thanks to the traces it leaves in the present and the observations – and our knowledge – are needed for an interpretation of the facts in the past, too. In August 2014, he added a 12-minute video on the measurement problem. Here, I would agree with almost every word. For example, it is nicely explained that the decoherence doesn't transform the uncertain, superposed quantum options into objectively well-defined quantum outcomes. Decoherence in no way modifies quantum mechanics; and it in no way reduces the role that the observer must play in applying and verifying the predictions of quantum mechanics. There are lots of nice quotes and terms such as the "Heisenberg choice" (an observer has to choose the question, what observables are measured etc.) and the "Dirac choice" (Nature randomly chooses one of the answers, according to the predictable probabilities, but the set of possible answers depends on the previous "Heisenberg choice"). Famous physicists from the past and the present offer their relevant quotes that paint a clear picture. The metaphysical prejudice of many other physicists is identified, too. In October 2014, the channel posted this wonderful 17-minute critique of the "many worlds interpretation". Most of the basic, apparently insurmountable problems that prevent us from saying that "there exists an actual MWI-like alternative to the 'idealist' or Copenhagen picture" are made explicit and very clear. Adrian Kent is the main philosopher criticizing MWI whom the creator of the video likes. It's obvious that I would naturally and instinctively try to avoid some of the words that sound unnecessarily religious etc. But those shouldn't prevent you from seeing the physical content – which is important and correct, regardless of the "different culture" to which the creator of this video belongs. Two weeks ago, the 9-minute video "The Case for the Soul: Quantum Biology" was released. It is the newest addition on the channel. It discusses the importance of quantum mechanics – and its subjectiveness – in the biological systems and especially the human mind. And the creator shares his opinion that the brain is a form of a quantum computer. As you know, I don't really believe it's possible because the relative quantum phases quickly decohere in the wet, warm, and chaotic environment of the brain. The narrator is aware of this criticism and addresses it in some way which looks semi-intelligent to me although he hasn't persuaded me, of course. But the key "loophole" that is mentioned and that I understood could be the claim that the qubits stored in the human brain are remembered by the relative positions of nuclei – that differ by as little as a femtometr depending on the value of the qubit. This small difference is why the decoherence isn't fast enough to destroy the quantum coherence of the brain too quickly. That's great – there must exist some small length scale at which the decoherence of the "location of a nucleus in a brain" becomes slow enough so that it won't cripple the "quantum computation character" of the brain. I would agree with this. On the other hand, if the relevant distances storing the qubits are so tiny that the environment can't distinguish them, it's hard to see how the brain itself may distinguish them, either! If the result to a "thought process" in the brain ends up being encoded in some femtometer-precise location of a nucleus of the brain, how does the brain measure whether the coordinate is 0 femtometers or 1 femtometer so that the person's mouth may say "zero" or "one" depending on the measurement? I don't really think it's possible. If the two microstates are hardly distinguishable by the environment – by thermal photons that are flying inside the brain all the time, and similar degrees of freedom – they are almost certainly hardly distinguishable by other, "important" parts of the brain, too. Moreover, I think that the tiny differences between the possible locations of nuclei are always entangled with some much greater differences between the possible shapes of the electron clouds – and those do decohere extremely quickly. But even if I ultimately think that his conclusion about this question (whether the quantum computation takes place in the brain) is flawed, I feel that his picture is pretty intelligent. More generally, I am absolutely convinced that none of the staunch atheist activists who claim to "possess" the trademark of science – and who claim to defend the trademark against anti-science groups such as the Christians – and who find some of the conclusions of quantum mechanics inconvenient would be able to produce videos about the foundations of quantum mechanics whose quality and coherence would match or exceed the quality of these InspiringPhilosophy videos. It seems totally plausible to me that the Christian creator of the videos is actually more intelligent than the atheist activists. Is he also more honest? It may surely look so. But it is not necessarily the case: This conclusion may very well mix up the causes and their effects. Maybe his videos on quantum mechanics seem more honest than the contrived constructions by the atheists not because the Christian guy is more intrinsically honest; but because Nature and science "accidentally" ended up being more friendly towards his metaphysics than to the atheists' metaphysics in this case which is why the Christian guy didn't have to be as dishonest as the atheists ;-) to achieve the goals that he cares about as much as the staunch atheists do. But there are also reasons for me to think that he is intrinsically more honest, after all. One of the reasons is that the correct "idealist" interpretation of quantum mechanics he ends up advocating doesn't seem to be "exactly the right thing" he would need for the defense of Christianity. You know, the word "idealism" may be closer to Christianity than to atheism. But what about the details of his claims about quantum mechanics? He admits that the act of the observation shapes the results – it "creates" the world – and there may be many different observers who have their own, complementary knowledge and points of view. The observer is no longer passive: Each observer creates his own data and his own world of facts. Is that what the hierarchy of Catholic apparatchiks needs? I don't think so. A church surely wants the individual sheep to be passive observers, doesn't it? It doesn't really want to give these "immense powers" to basically create his own world to every human, I think. Similarly, the word "Islam" means "submission". The "individuality" that quantum mechanics gives to observers may actually be against the political needs of these "ideological" religions such as Christianity and Islam. Equivalently, quantum mechanics teaches us that (especially before a measurement) there is no "objective truth about the state of Nature" from which all the knowledge of all observers would be derived as projections or a subset. But don't all religions actually want the only objective truth about the state of Nature to exist? The only objective truth about Nature should be one that God knows – and He should be omniscient, right? The new quantum mechanical reorganization of the data we know and predict about Nature may be more "idealist" than classical physics was. 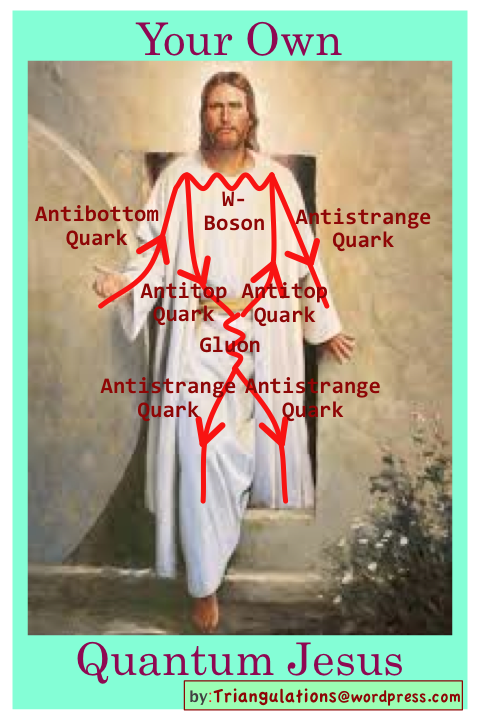 But in the sense I just described, the new quantum mechanical view doesn't seem to be more convenient for the political picture required by religions – a picture with an omniscient God. Classical physics was doing great with omniscient God while quantum mechanics with its observer-dependence (and therefore "relativism" of a sort) seems to be more heretical, doesn't it? Correlations between the scientific breakthroughs on one side and religions or philosophies on the other side may continue to appear for pretty long periods of time. But they ultimately go away. Science looks for the answers to its own questions. The questions are being invented according to science's own rules – and the answers are being selected by science's own, the scientific method, too. Science is ultimately independent of the religions – but it is independent of other philosophies such as the philosophies defended by the atheist activists, too. The superiority of the Christian apologists' videos about quantum mechanics relatively to the atheist activists' rants against proper quantum mechanics reminds us of this fact. As long as the atheist activists refuse to place the science's own rules above their own metaphysical prejudices, their prejudices are approximately equally likely to be debunked by the scientific progress as the believers' prejudices. In this sense, atheism is just another unscientific religion, at least in the long run.